We're kicking Summer off with a bang . . . actually, that may have been an artillery shell. Either way, things are heating up with these new releases! Experience the gritty, futuristic warfare of Ogre in under 30 minutes! 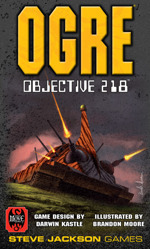 Ogre: Objective 218 takes the classic game Battle for Hill 218 from Your Move Games to the world of Ogre, with opposing forces battling for control of The Crater. Supply troops, launch assaults, and roll out your Ogre Mk III to smash your opponent's chain of command, and take their Command Post. Spyke got a playmat, and Flower wanted in on the action too! She's found the mother lode and has to fight her way out on this awesome playmat, with spaces for all your cards, as well as a special rule unique to this mat. It's Edwin Huang's gorgeous art on a high quality playing surface; how can you lose? 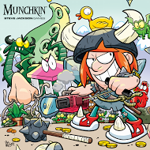 So you're the ultimate Munchkin fan, huh? Well, smarty pants, how are you going to store all those cards? We have what you're looking for: the ultimate in luxurious Munchkin storage, with a roomy plastic tray that's perfect for containing your overflowing stacks of cards, dice, and accessories. Make sure to shop at your FLGS to ensure you get your favorite box cover! Making messes, avoiding blame -- that's the name of the game when you're Simon's Cat. 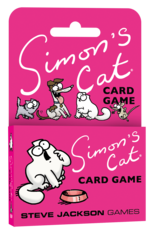 Featuring art from the critically acclaimed series, Simon's Cat Card Game is a fast, family-friendly game where your only task is to avoid making the biggest mess, and getting blamed for it. One cat loses, the rest are off the hook! It's the purrfect crime! Visit your friendly local game store today and let them know you want these games!